In Ancient Greece, victorious Olympians were crowned with olive wreathes. Upon the Olympics’ reinstitution in 1896, winners were still greeted with this symbolic prize, but also with silver medals. It wasn’t until the 1904 Summer Olympics in St. Louis, Missouri, though, that the Games issued gold, silver, and bronze medals for its top-three competitors. Let’s bite into gold, silver, and bronze to check out what they’re made of. All that glitters may be gold, etymologically speaking. Unchanged in form from the Old English, gold is from the Proto-Germanic *gulth- and Proto-Indo-European *ghel-, meaning “yellow.” This root could also mean “bright” or “shining.” And, apparently, all that glitters can be “green,” “blue,” and “gray,” for *ghel– so named bright colors and objects. This root *ghel– is definitely worth its weight in etymological gold, though, for it parented the Greek khloros, “pale green,” giving English everything from chlorine and chlorophyll to the name Chloe. It also parented the Germanic clean and clear. In fact, its Germanic kin are many, as Shipley cites: glare, glass, glaze, gloss, gleaming, glow, glower, glad, and glee. To these we might add gleam, glitter, glint, glimpse, glance, among yet others, all featuring the initial cluster gl-. Does this gl– mean something? The topic is contentious. Linguists call this gl- a “phonestheme,” an example of sound symbolism, the idea that certain sounds inherently have a meaning. Onomatopoeia might be familiar. The cow moos, the bee buzzes, the doorbell ding-dongs. These are all words that imitate or echo what they are naming. The sound symbolizes its meaning. But gl- is a little more interesting. It has no meaning in and of itself. Gl- on its own cannot be said to mean anything in the way that “cat,” “throw,” or “rumor” do. Or in the way that “pre-” or “post-” or “-ly” or “-hood” do. But it does appear in a family of words whose meanings are all connected–here, through a common sense of “shiny,” “bright,” “light,” “dealing with vision,” or what have you. Further, if you clip off the gl-, you aren’t left with a meaningful unit of sound. Take glitter or glance. If I take of the gl-, I am left with -itter and -ance, which don’t mean anything. (More technically, they aren’t morphemes.) Unlike when I undo the “un-” in “undo” or lob off the “-er” in “faster”: do and fast have meaning. Words beginning with fl– (flow, fly, flutter. flurry), sl- (slide, slippery, slick, slither), and sn– (snore, sniffle, sneeze, snout) also display this phonesthemic property. So, does gl– suggest the shiny or visual properties that its word family shares? Does fl– imply flying, sn– various nasal business? Globe, flower, and snow also feature their respective consonant clusters but don’t really belong in their respective phonesthemic families. The phenomenon is not absolute. Nothing is language is. But, given the data, it’s hard to deny that there is some level of truth to this sound symbolism. Nowadays, bronze may evoke being tan before being in third place. It turns out, though, that the alloy may have more in common with vanity–um, I mean skin cancer, er, social constructions of beauty, uh, tanning–than we might think. Bronze is an alloy of copper and tin, and comes to English, via French and Italian, from the Medieval Latin bronzium and its variant brundium. From here, the etymology is itself something of an alloy. As Partridge maintains, bronze is ultimately mined from the Persian birindj (other variants include birinj or pirinj), meaning “copper,” “for the alloy came to Europe from the East.” Skeat cites the Roman historian Pliny, whose writes of aes Brundusinium, referring to the Italian town, Brindisi, whose Latin name was Brundisium, “where bronze mirrors were made.” Aes could mean “copper,” “brass,” “bronze” and the various objects made from them include money, armor, and trumpets. Perhaps you’ll look extra bronzed in one of those mirrors. The chemical symbol for bronze is…Oh, you don’t remember it? Good. There isn’t one. Just making sure you’re awake. 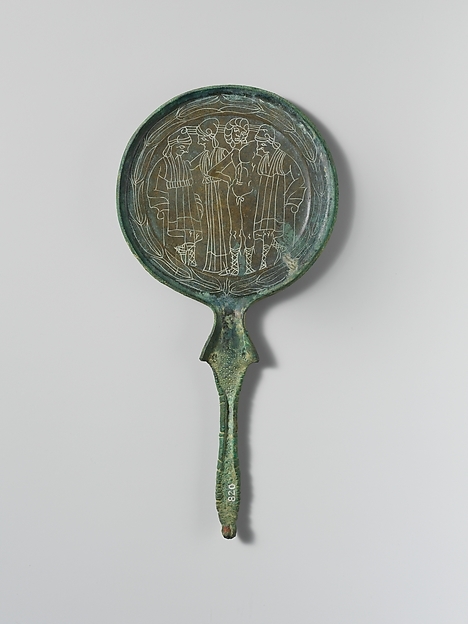 Etruscan bronze mirror, 3rd-2nd c. BC; image courtesy of Metropolitan Museum of Art. *Ghel-, *aus-, *arg-: some of our most precious treasures–an Olympic medal, say, awarding a once-in-a-lifetime performance against the most elite competition following years of training and sacrifice–come down to “bright” and “shiny” objects. That’s a bit glib, of course, as metallurgy certainly had its hand in advancing civilization. But perhaps not too glib, for might not these roots begin in that most fundamentally human act–the act of curiosity, marveling at an object glittering in a riverbed or on the wall of a cave, brighter and shinier than the unremarkable dirt and rock, tinkering and tooling and experimenting with them until it is shaped into something new, an instrument of culture? It may not take much to get our attention, but we sure can do a whole lot with it. What a great and entertaining post! Thanks for sharing. I’ve always been so compulsively articulate and a great lover of word origins. This is exactly my kind of post. I’ve never understood why people place so much value in gold. It looks nice in jewelry, but so do a lot of other things. Anyway, word origins don’t seem to shed any light on why it’s so valuable. Maybe just because it’s shiny and lustrous. Wasn’t it once upon a time used as $? Salt was too ..hence the term “salt of the earth” . Both gold & salt are incessantly referred to in the Bible & all sorts of other ancient literature. Their reputation these days for such uttermost importance appears a bit of a throwback to then. Isn’t all money ultimately what we call a fetish in its general sense? There’s no inherent value to it other than what we assign to it, historically, magically, culturally, etc. Money serves a purpose. It facilitates commerce. If I make bricks, and there is no system of money, I have to transport bricks to the market and search out others who will trade their products for my bricks. It’s a very cumbersome way to make a living. By agreeing on one form of money, I can sell my bricks and use the money to get other products I need. So it’s not just a fetish. It’s a measure of confidence. Gold is easily malleable and can be formed into shapes (cups, crowns, chalices), and has luster. We tend to value things with luster (beautiful people, jewels, shiny metals – aluminum was once pricier than gold). So do “lust” and “luster” share a common root? Maybe that would offer some clue as to the humankind’s long fascination with gold. I suppose we should search for whether or not it is a cultural universal to value precious, natural things (gold, turquoise, etc.) and use its possession for complex, organized cultural transactions or rituals. Great questions on “lust” v. “luster.” Unchanged from its Old English form, “lust” looks longingly back to a Proto-Indo-European *las- (eager, wanton; “lascivious” is cognate) while “luster” gets its shine ultimate from Latin’s “lux,” meaning light. Neat, I had never known this before! Word origins has always been something I took deep interest in. Yay! for etymology! 🙂 “Ghel-” meaning “yellow” in Proto-Indo-European makes perfect sense to me as a Norwegian. Yellow is “gul” in my language and gold is “gull”. That indeed makes sense. Heading to Copenhagen for the first time this summer and looking forward to spotting some cognates. Thanks! I was thinking of covering this exact subject for my next post. Nice! Join in! The more, the merrier. Would love to read your take and findings. Its like a golden post! Brilliant post! I love knowing the origins of words. Dictionary corner on Countdown, easily my favourite part! Fascinating! The Irish for gold is ór but I presume our word for bright, geal (pr gyal) is linked to the root of gold. Our word for silver is nearly the same as the Latin, airgead. Surely “ór” is cognate to the Old English “ar,” which could mean “brass, bronze, copper,” from that PIE *aus-, origin of the Latin term for gold and English’s own “ore.” Consider continental Celtic, this would make sense. Another entertaining post relating to one of my passions. Language is beautiful! This is groovier than a groovy thing. Wellworth the read. Thanks! I typically do a post a week, so there’s plenty more word-nerdiness ahead. Mi è piaciuta questa ricerca etimologica, che spiega le origini dei nomi oro, argento e bronzo, i tre metalli conosciuti nell’antichità. E’ da rilevare anche qui che la loro derivazione è orientale. Know of any Asian cognates that would fill in some of the gaps? I’m interested in etymology and Sociolinguistics, swearing in particular. I’ll be posting on that shortly.